The iPad Is Coming! The iPad Is Coming! 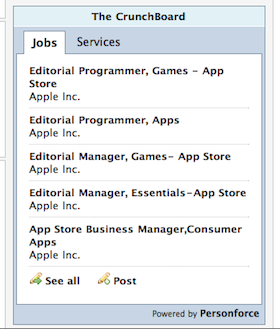 Apple Takes Over Our Job Board. From time to time, Apple posts about new positions on our CrunchBoard job board — which we appreciate. For example, last December they posted an opening that seemed to suggest an expansion of iWork in the cloud. But today we noticed something rather interesting, Apple has posted several positions — so many that they have completely taken over the job board widget that appears on TechCrunch. And all are centered around the App Store. This shouldn’t really come as a huge surprise to those who follow Apple . The much-hyped iPad device is set to launch on April 3, and with it will undoubtedly be an onslaught of new apps. In fact, it appears that the wait times for app reviews has been slipping substantially in recent days as developers are rushing to submit their iPad apps before the March 27 deadline (to be considered for an initial launch app) — and it stands to reason that Apple is giving priority to iPad apps to get reviewed initially. It would seem that Apple is bracing itself to take the App Store to the next level with this new device. So what kinds of positions is Apple filling? Interestingly, most are editorial-based, meaning Apple is looking for people who can help distinguish the good apps for the bad ones, for promotion. For example, the Editorial Programmer, Apps should be someone who, “is responsible for the discovery, selection, and promotion of apps”. Other positions revolve around promoting the business behind the App Store. Something else interesting is that Apple is looking for people who can help with the “promotion of apps on the desktop as well device App Stores.” This suggests that Apple may in fact be thinking of an App Store idea for the Mac itself. The company recently launched a new Mac Developer Program similar to the one it offers for the iPhone (and now iPad). Three of the positions listed are also specifically related to game apps. Games have been the largest portion of the App Store for much of its existence, but were recently overtaken by books. But seeing as Apple is now doing its own book promotion via iBooks, games look to reign supreme again — especially with the larger screen iPad. And clearly Apple knows this.